I started fact checking David Barton’s historical claims in April of 2011. I had been writing about Bryan Fischer’s odd claim (seemed odd to me) that the First Amendment only covered Christians. Examining Fischer’s claims, I found that Barton was a big influence on Fischer. My first post on Barton related to the Jefferson Bible (see also this follow up post). Others on Jefferson followed which eventually formed the basis for Getting Jefferson Right, my book with Michael Coulter. For all posts fact checking David Barton’s historical claims, click here. Earlier this month, I pointed out that Robert Morris referred to his honorary degree from his own university (The King’s University) as a “doctorate of literature.” This sounds like a real earned doctorate but in his case it is not. Morris has not completed any college degree and has acknowledged using ghostwriters to write his books. If you go to Morris’ church bio now, you will see that the reference to the doctorate is missing. It has disappeared from the Facebook page as well. It does still appear on this Amazon author’s bio as well as a smattering of places around the web. It does not appear on the Gateway website. There has been no comment from Morris or Thomas Nelson just crickets and scrubbing like it was never there. At the end of the broadcast, the gang makes light of the number of Facebook likes the Getting Jefferson Right page has. How about another comparison with the now pulled from print The Jefferson Lies? How about comparing the number of favorable reviews from actual historians each book has? I know our book has several quality reviews posted on our book website, but I am not aware of any for The Jefferson Lies. Looking for one, I went to Barton’s book website for The Jefferson Lies. On the front page, there is a link that appears to be a review page but it goes nowhere but back to the home page. I know of several critical reviews for The Jefferson Lies but no positive ones from historians. In August 2012, several media outlets reported that Jay Richards, a philosopher and theologian with the Discovery Institute who was also a public endorser of Throckmorton’s book, had asked “10 conservative Christian professors to assess my work.” It was reported that their responses were “negative.” However, some of the ten listed by him had flatly refused to participate in his quest but yet were still listed as providing “negative” responses against me. And in direct conversations I had with Richards after he coordinated these attacks, he openly confessed to me that he knew very little about history. Only four of the ten scholars contacted by Richards actually provided any critiques of my work: Glenn Moots, Glenn Sunshine, Greg Forester, and Gregg Frazer. Of these four, only Frazer specializes in religion and the American founding, but his critique did not even address The Jefferson Lies, and it is not clear that he even bothered to read it. Instead, he watched and criticized a twenty year old video entitled America’s Godly Heritage. I asked Jay Richards if the claims in this paragraph are accurate. Richards said that he recalled about six written responses from historians with others saying they didn’t have time to do a written review. In other words, they provided reactions but not all were written. None were favorable to The Jefferson Lies. Some who lacked time later commented publicly about Barton’s vision of Jefferson. In an August 2012 World article by Thomas Kidd, Daniel Dreisbach, Kevin Gutzman and James Stoner all disputed Barton’s characterization of Jefferson as being orthodox before 1813. In the paragraph above, Barton minimized the critical reaction to The Jefferson Lies. Richards agreed that Gregg Frazer’s written submission was about America’s Godly Heritage (I published Frazer’s devastating critique here) but reminded me that Frazer also critiqued an aspect of The Jefferson Lies in World. It also should be noted that America’s Godly Heritage is still for sale on Wallbuilders’ website so Barton’s qualification that the DVD is twenty years old is irrelevant. The entire context is missing from the statement: I contacted a diverse group of scholars with related expertise and clear conservative credentials to ask them their opinion of Barton’s work and The Jefferson Lies in particular. I also asked for written evaluations if possible. The purpose was to compile these and give them to Glenn Beck so he could evaluate them for himself. In the meantime, Thomas Nelson got word of genuine controversy over the book, conducted their own evaluation and pulled the book. This happened before the World article ever came out, and so was not in response to negative media criticism. Fewer than ten written evaluations from the scholars does not mean the other scholars refused to critique Barton. They did offer Richards feedback and, as noted above, some of them were interviewed by Thomas Kidd for World. Barton’s answer to critics omits this context. Furthermore, Glenn Beck had this feedback and chose to disregard it. He continues to do so, as do other religious right leaders who know about the false historical claims but continue to tout Barton as a respected historian. Another little known detail about the incident is that Thomas Nelson had pulled the book from publication before World reported on the story. I have learned that the book had been pulled from the publisher’s website at least several days before it was reported in World. Barton also claims in his response to critics that Simon & Schuster picked up The Jefferson Lies. To date, that publisher has not issued another edition. From the vantage point of the present, it seems more remarkable than ever that Thomas Nelson pulled The Jefferson Lies from print. Over the last year and a half, we have witnessed publishers stick with authors who have plagiarized material and books with dubious content. For instance, Tyndale House stuck with Kevin Malarkey’s The Boy Who Came Back from Heaven long after the publisher was aware that there were credibility problems with the story. The publisher only pulled the book when the boy who was the subject of the book publicly recanted his story. The Jefferson Lies publisher, Thomas Nelson (now part of HarperCollins Christian), is sticking with similar book Heaven Is for Real and quietly fixed multiple plagiarism problems in Mark Driscoll’s Real Marriage. Even in this publishing environment, Thomas Nelson pulled a best selling book because of their investigation of the facts. Clearly, Thomas Nelson’s public statements about the reason for pulling the book are incongruous with the above facts, so was there perhaps some other reason behind their announcement? Quite possibly, for only two weeks prior to suddenly dropping The Jefferson Lies, Thomas Nelson had been taken over in an acquisition by Rupert Murdoch and HarperCollins Publishers. It is hard to know what Barton is implying here. Murdoch is a conservative who founded Fox News, a network which has been generally friendly to Barton’s brand. Given other books HarperCollins Christian offers and has preserved (e.g., Driscoll’s book), it is hard to make a case that the change of ownership had an any effect on the decision to pull the book. Today, HarperCollins Christian Publishers released a marketing email for their heaven tourism book, Heaven Is for Real, in the face of the failure of Tyndale House’s book The Boy Who Came Back from Heaven. In short, HCC is standing behind the Colton and Todd Burpo’s story. As it turns out, another one of HCC’s authors is Kevin Malarkey, the author of the now discredited The Boy Who Came Back from Heaven. Marlarkey’s second book (with agent Matt Jacobson), titled Beautiful Defeat, is available now on the HCC website. Alex Malarkey’s retraction undermined the credibility of the entire enterprise involving Kevin Malarkey and Matt Jacobson and so I wonder if the collapse of The Boy Who Came Back from Heaven presents any problems for HCC. What an interesting reward for trying to be honest and transparent. As is clear from an examination of the paper, Frazer did not look at each one of the quotes in Barton’s first book. He specifically examined the DVD series America’s Godly Heritage. Even though the DVD is still for sale, Frazer found faulty quotes in it. As Barton says in his footnote, this paper was presented to Barton by James Robison surrounding the time when his book was pulled by Thomas Nelson (August 2012). 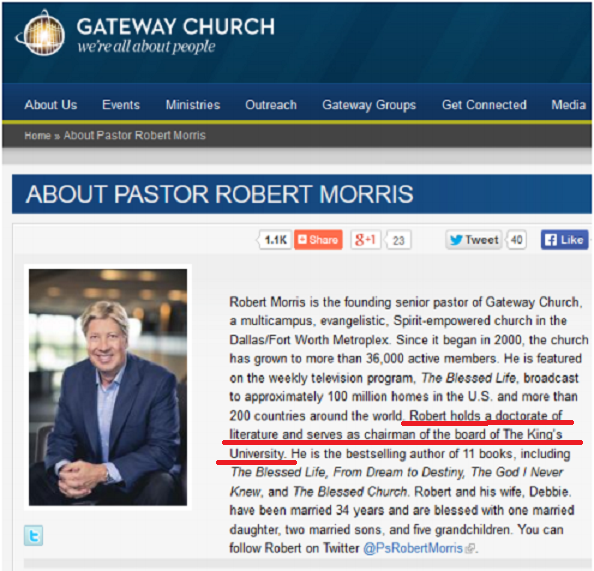 Robison is an apostolic elder at Gateway Church and host of the television show Life Today. As this footnote reveals, Robison was in on the confrontation as was Richards and the Christian historians. While I don’t know specifics, some met with Barton at his ranch where he rejected their advice and counsel. Furthermore, Barton met with at least one leader at the Family Research Council in August 2o12. In that meeting, Barton’s errors were confronted with promises from Barton to provide corrected material. However, nothing happened on Barton’s end until the Family Research Council was confronted by numerous Christian historians in the Spring of 2013. Despite numerous clear factual errors, FRC continues to have Barton involved in their presentations to pastors. As Politico documented in 2013 (Sen. Ted Cruz defends Barton in this article), Barton has been accepted back into the good graces of the political arm of the Christian right (e.g., this apologetics conference). More to come: Gregg Frazer’s review of America’s Godly Heritage is a devastating critique of this popular DVD program. It has been read by high level decision makers on the Christian right and ignored. I urge readers to read it and pass it around. I intend to give it more attention by focusing on various highlights in upcoming posts.